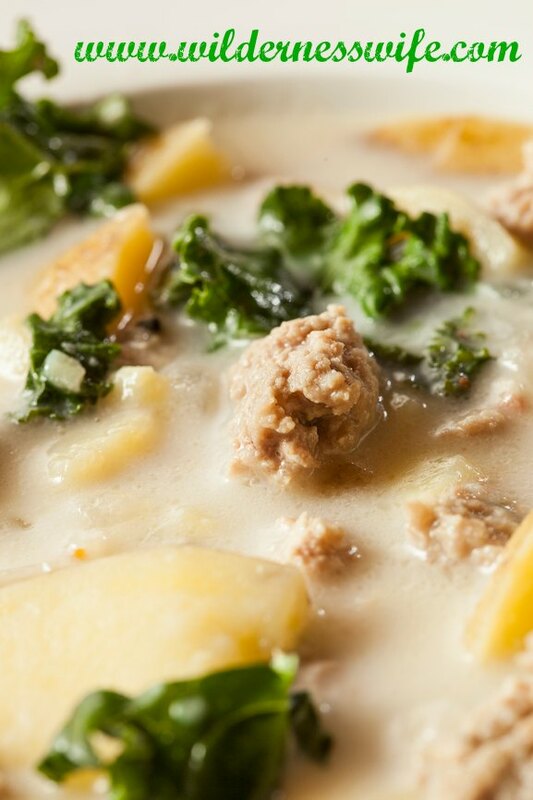 Olive Garden eat your heart out – it’s Slow Cooker Zuppa Toscana Soup for supper! 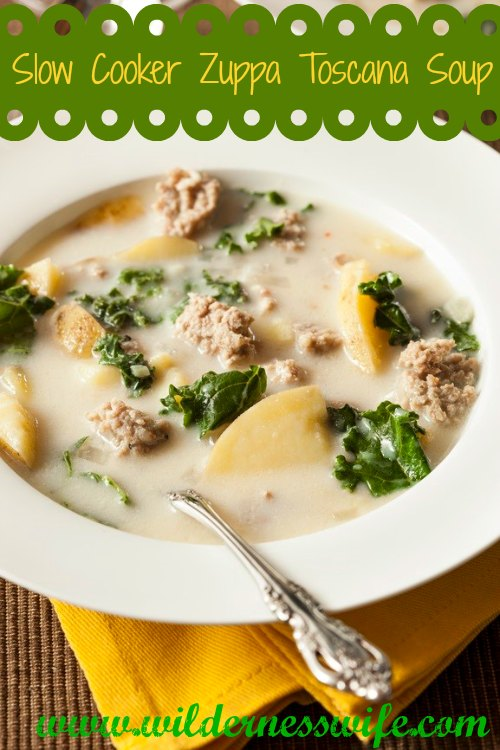 Warm and hearty Zuppa Toscana Soup adapted from the Olive Garden favorite is easy to prepare in your slow cooker. Winter seems like a soup fest! If I have a fire burning in the kitchen wood stove, I will leave pot of soup simmering on it. But even in the winter, I’m pretty busy and don’t always have the time to babysit the kitchen woodstove so I rely on the old slow cooker. Crock pot cookin’ is a favorite of mine year-round. 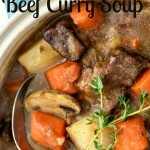 And I love it for soups – soups are so good when they have been slow cooking all day. It gives the flavors a chance to blend together. Creamy and satisfying this Slow Cooker Zuppa Toscana soup is comfort food at its best! Bill’s all time favorite soup is Olive Garden’s Zuppa Toscana! When we go to the Olive Garden he will have at least two bowls of it. So I started making it for him at home. 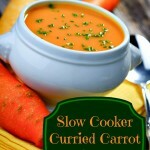 It is an easy soup to make and is even better when cooked all day in the slow cooker. Although I can’t make a claim that it’s healthy (would be a stretch with sausage and cream as ingredients) the kale does add a healthy note to it! This delicious soup from the Olive Garden a favorite at our house! I have adapted the recipe to cook in my crock pot/ slow cooker. Yummy! Brown bacon in large skillet till golden and crispy. Remove from skillet and place in crock pot. Brown sausage in same skillet. Be sure to break up large pieces. Remove from skillet and place in crock pot. Cook onion in same skillet till translucent then add garlic and cook for 1 minute more. Add one cup of chicken broth to deglaze the pan. Be sure to loosen all the bits of crusty goodness from the pan and pour all into crock pot. Add the rest of the chicken broth, the water and the potatoes to crock pot. Cook on low 4-5 hours until potatoes are tender. Add kale and salt and pepper to pot and cook for 1 more hour. Add cream and allow to heat for 15 – 20 minutes. I have always wanted to make this soup. I LOVE olive garden’s version. I’ll be pinning this to our MMBH Board. I’ve never made this soup before. Sounds delicious. Stopping by from the All Things Pretty linkup. We have to drive two counties over to get to the nearest Olive Garden but yet those tempting commercials are always popping up all the time. It will be quite nice to be able to pull this out of the recipe box. Thanks so much for sharing. I’m visiting from the Farm Blog Hop. I can relate to your plight. 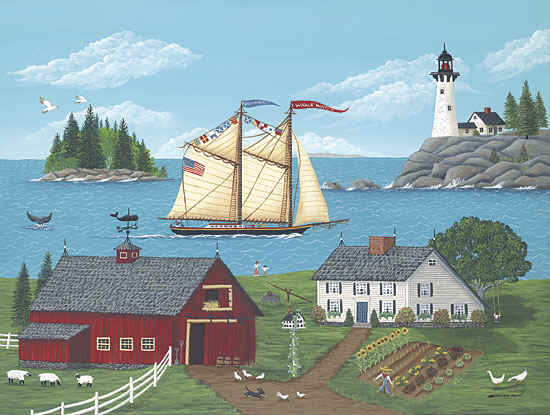 We are 85 miles from the nearest Olive Garden in Bangor, Maine to the south of us. But we do go to Bangor a couple of times a month and the Olive Garden is always on our list of things to do! 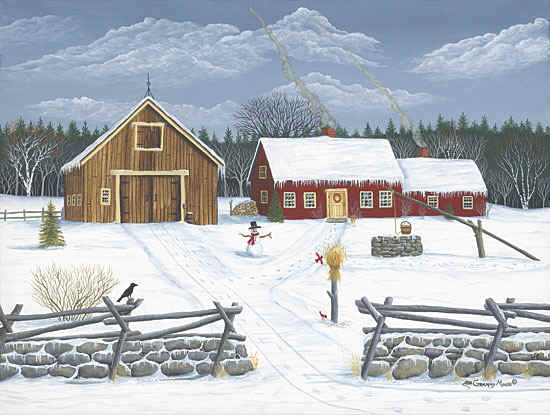 Living in such a remote area is a trade off – we give up convenience for quiet and rugged beauty, but its worth it to me. Sounds amazing….there is still enough cold around to make this often! 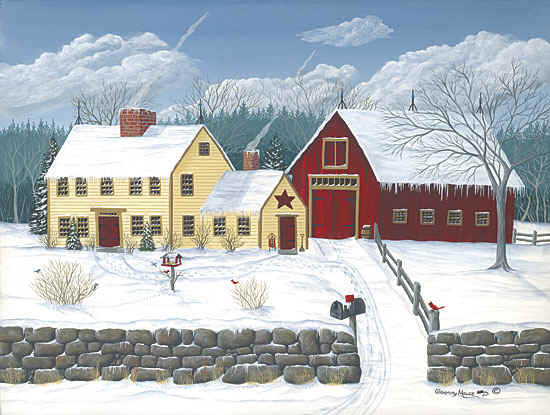 Thanks for posting on the Thursday Blog Hop! This looks so good can’t wait to try it. This has for sure been a soup winter! This is my favorite soup!!!! I’ve never seen it made in the crockpot before, so excited! Totally pinning and making! Thanks! Love your picture! Stopping by as co-host of Homemade link Party. This is my favorite soup!! Thanks for sharing with us at Happiness is Homemade! Hope to see you back on Sunday! This seriously is one of my all time fav soups! My hubby Bill loves this stuff! He would eat it everyday! And it is such an easy soup to make……real comfort food. Looks tasty!! Thanks for sharing at the Happiness Is Homemade Link Party! Pinning to the party board and can’t wait to see what happiness posts you share next week! Have a terrific week!